Customers seeking aerial photographs are invited to locate the area they are interested in by identifying it on the relevant 1:25,000 or 1:100,000 Tasmap or use the internet based map viewer for the Land Information System Tasmania (LIST) called LISTmap. Photographs can be forwarded by post to any Service Tasmania outlet for collection or to an address nominated by the client. If the search is over a large area or involves a number of different years and will take more than 15 minutes, a charge will be levelled for every 15 minutes. 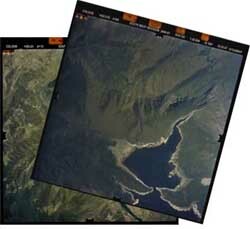 If the enquiry is for aerial photographs taken since the 1983-84 photography season, the computerised photo enquiry system can be used. For earlier seasons, a physical search is necessary. The necessary processing work will be undertaken by the Service Tasmania Hobart shop where a physical search is required, or if the relevant shop does not have access to the computerised photo enquiry system. Fees will be advised at the time of ordering and must be paid when ordering.